My name is Valerie Burns. I’d like to tell you a little bit about my fitness history. I have worked in the fitness industry for the past fifteen years and have instructed a variety of class styles, during this period. They include aerobics, step, body-conditioning, body pump, indoor group cycling, and more recently, over the past six years, ‘fitness pilates’ which has now become the main area and passion of my teaching. Recognizing how imperative it is to address all elements of fitness into a person’s training programme, I am committed to implementing many training principles into each session. 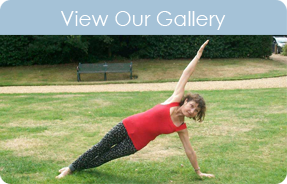 Therefore, I have incorporated a variety of exercise concepts, such as yoga, weight bearing, resistance and cardiovascular activities into my pilates classes in order to offer participants a varied and stimulating workout. However these activities are still based around a strong pilates discipline. Apart from offering mind//body stimulation, this also allows exercisers to obtain a variety of training modalities in many areas of fitness, including stamina, strength, resistance, flexibility, balance and posture, co-ordination and joint mobilization. Heavy emphasis is always upon improving spinal alignment and posterior and anterior strength of the trunk, throughout each session. This is known as Core Stability. I do however, also place significant importance on improving strength and muscle tone to all other areas of the body. I utilize various resistance materials and hand weights etc. to obtain the desired results, and endeavour to vary the exercises routinely, in order to create stimulation, motivation, and exercise adherence. My classes are held in Church halls in Southgate, Oakwood and Winchmore Hill. They are non-competitive and sociable, operating on a drop-in basis for men and women of all ages and fitness levels. I explain and demonstrate exercises at multi levels, in order that participants can work- out at their individual and appropriate requirement. and incrementally. In addition to the classes, I also offer motivational weight management sessions, incorporating dietary advice and exercise to help you achieve a healthy weight, improved fitness ability and a motivated approach to a continued healthy lifestyle. If you need advice or support to help you improve your well- being through a healthy eating plan, and improvement to your physical activity levels, I could assist you with the tools you require to help you reach your goals. Whether you would like a one-off session to kick-start your own diet, and exercise plan, or a succession of sessions to give you continued support, through both discussions and exercises, those options are available to you. I can offer you flexibility to fit in with your lifestyle. Each session will normally last for one hour, at a cost of £45.00. For further information and venue locations etc, please feel free to contact me via e-mail or telephone.